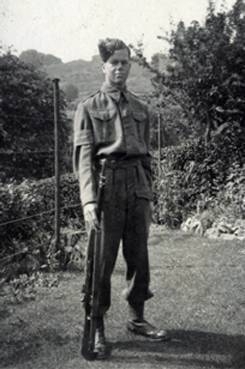 Roderick James Weston Timms (my father) was born on 22 March 1921, the youngest of six children of Florence May and Ernest Tom Timms. The photos on this page were taken in 1938 and 1940. 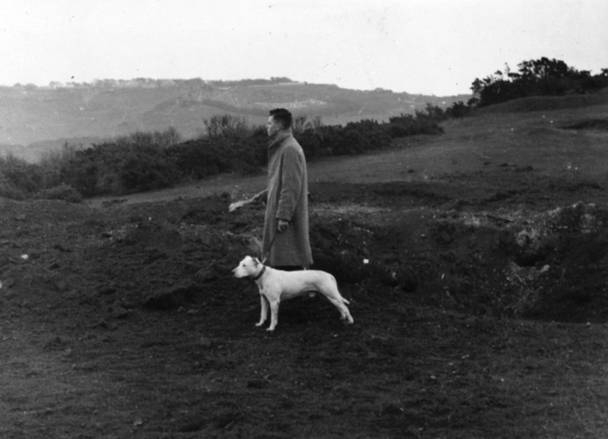 The photo on the rightshows Rod with his dog Bonzo standing in a bomb crater watching bombs drop on Folkestone. During the war Rod's parents lived in Chichester Road Sandgate. Rod often took Bonzo for walks over the hills and fields behind their house which was below Shorncliffe Army Camp. Rod's involvement with the sea and boats and his lifelong interest in Scouting combined during his youth. He became a Sea Scout at Sandgate. He was very proud of his King's Scout badge. 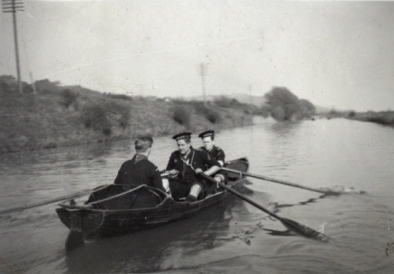 The photo of Rod rowing (in the bow of the boat) on the Royal Military Canal at Hythe was taken in 1938. In the "Banner" at the top of each page Rod is on the extreme left T E B Mills is fourth from left. 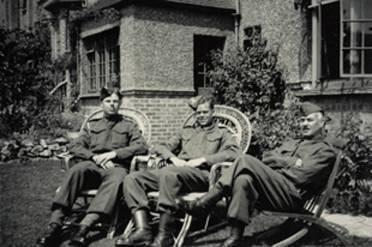 In the picture on the right Rod is shown in Home Guard uniform. Bottom right captures a family scene at Turakina Chichester Road at the beginning of the war. Many parents were not as lucky as my Grandfather and Grandmother, despite many scrapes and dramas all of their six children survived the war. Rod is in the centre of the group, his father is on the right and one of his brothers Hugh is on the left. I have divided the site into pages, they will start with 1939 and fire watching & aircraft recognition, then progress to joining the Navy and basic training, then continue with the 8th ML Flotilla, ML 345 and Scotland, then the 9thMGB MGB 118 and 35thMTB flotillas MTB 448, MTB 450 and MTB482 and then include his involvement with HMS Walrus and the Far East including his first command culminating in his parting with the Navy because of his wounds (a broken leg playing football!) Fortunately Rod kept copious notes and diary records and spent time with his longstanding friend T E B Mills researching war records etc. There is a huge amount of information in his records, only a small portion appears here. Rod applied twice during 1939 and 1940 to join the RAFVR and the RNVR, on both occasions as a pilot but was refused permission due to his reserved occupation status. He asked his father, as the age of majority was then 21, permission from this source resulted in the same response, refusal. Rod's father Ernest was a Chemist in Sandgate at 89 High Street, therefore he had access to films and chemicals for developing and printing. Rod was a keen photographer all of his life.